For those of us that wear makeup consistently, it can often be difficult to go without it. 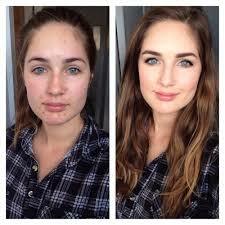 Many of us started to wear makeup in middle or high school and it has become a part of our daily routines. We get up in the morning, put on clothes and do our makeup. Often times, we don’t even realize how much it affects us until we are in a position to be without it. Imagine it’s Sunday morning, and you’re going to Findlay Commons for breakfast. You aren’t wearing any makeup. You feel different, don’t you? Maybe you make less eye contact when interacting with people? Chances are, you feel less confident because you aren’t wearing any makeup. I decided to some research on this topic. Throughout my research, a common theme I kept finding was the societal expectations influence girls and women into feeling like they have to wear makeup. There are pressures to look certain ways in various situations, and women often vary their beauty routine to match the situations they will be in during each specific day.I also found that many women associate their physical appearance with their over all confidence and self esteem. When wearing makeup, women are able to cover up imperfections and highlight certain points in their face, which makes them feel more confident. In this study, four caucasian, college age women were asked to change up their makeup when going to class and going out with friends. At the beginning of the experiment, the women were told to wear the makeup they would normally wear both to school and when going out with friends. Then, they had to swap the makeup looks. They had to wear the makeup they would wear to go out to a party to class, and the makeup they would wear to class to a party. The participants had to fill out a “before” survey, and an “after” survey in order to document their feelings. The women used their own makeup products and journaled how they felt when wearing the products during certain situations. The participants were also being measured on their anxiety levels during the situations, so they had to fill out Spielberger’s state-trait anxiety survey to record their anxiety. Through journaling, the women had to express exactly which products she used in each situation and how she felt about using them. The results to this experiment were quite interesting. It turns out that the women felt more anxious when wearing “class” makeup period. They felt more confident when they wore going out makeup both to class and to a party. The author of the article seems to think that reason that the women felt the most confident when wearing going out makeup to a party is because they were distracted and not thinking about their appearance. It is also said that the women felt second most confident when wearing going out makeup to class because they had time to plan their makeup, yet they also had the time to sit in class and think about their appearance. It is also important to note that the participants were hyper focused on their appearance during this experiment, which could have thrown off the natural anxiety levels a bit. I also found this interesting video which shows a girl who went from wearing makeup every day to not wearing it at all. At first, she was extremely self conscious, but eventually she found confidence in a bare face. While I was unable to find research with a definitive answer about how exactly makeup affects confidence, it is easy to conclude that people who routinely wear it are often less confident without it. I can only conclude that this topic is all relative. This image shows what a woman looks like before putting on makeup and after putting on makeup. It is probably easy to understand from this image why some women are more confident after covering imperfections. Scott, Sarah. “Influence of Cosmetics on Confidence.” Running Head: COSMETICS, SELF-ESTEEM, AND COLLEGE WOMEN (n.d.): n. pag.Psych.hanover.edu. Web. This entry was posted in Uncategorized on October 5, 2015 by Alyssa Kaplan. Very interesting blog post! This immediately caught my eye because I myself have experienced what this article talks about at first hand. Being a teenage girl, there are definitely high expectations when it comes to appearance especially in this day in age. I have actually even felt what it’s like to be in the experiment done, and the legitimate affects of it all. I also like how you related it back to class and discussed the confounding variables at play, such that the people examined were very looks oriented and focused more on how they appeared than usual. Very interesting blog and well written. Well done! Megan, I definitely agree that peoples personalities do play a role in this issue. For women who are more relaxed or maybe more athletic, wearing makeup might not be something that they are interested in, whether it’s for convenience reasons, or just the way they feel. I do believe that a lot of girls also learn about makeup through their moms or older sisters, so that could also be a third variable. Brian, I do believe that it is ok for women to feel more confident when wearing makeup. That being said, I think it’s all about balance. I believe that women should feel confident enough without it to be able to go in public and be around friends and family with a bare face. I do understand the desire to wear makeup to social occasions and on a daily basis in small amounts. To answer your question, I think it is neutral for women to wear makeup. As I said, it’s all about a balance. Brian Wess brings up the question “Is it good, bad, or neutral to rely on makeup to make you feel more confident?” Ultimately, I think it’s neither of those things. Everyone has their own opinions and feelings as to what makes them feel most confident and if wearing makeup makes them feel good then what’s wrong with that? At the end of the day though it really boils down to you not RELYING on makeup to make you feel good about yourself because the only thing that can make that happen is yourself. Makeup is a great tool to add boosted confidence to our self esteem but learning that your more than just a face in the mirror is what really counts. I found your blog extremely relatable to me and every other college female right now. In high school my “class makeup” would be the most makeup I’d ever put on rather than “going out makeup.” In college I do believe girls don’t feel any self esteem issues from wearing makeup in class from going to a party. I think girls don’t care what they look like in class, especially for early classes and big classes. I believe girls don’t care what they look like when waking up for a 8am class. I did appreciate your blog and I think it is very relevant to our society and what is happening now. I thought that this was a very good topic to bring up because so many people can relate to it. I agree with you that the participants were focused on their appearance throughout the study so it could skew the results, so it’s not a 100% reliable but, I do think it is very relatable. As I was reading this I was wondering if there could be a third variable involved in this and I was thinking that peoples personalities could be one. Peoples personalities could relate to why people do or do not wear make up, and also they could relate to whether people are more or less confident then others. I really enjoyed your blog! I started wearing makeup regularly in high school and can remember hating putting on foundation for school dances, but now I wear foundation practically every day. I do find myself more self aware and uncomfortable in public when I have a no make up day, but I’m gradually getting use to it- cause come on who puts on a flu face of make up for an 8am? I can remember never wanting to step out of my house without makeup I think as you get older you lose interest in always looking perfect, but maybe thats just me. Its interesting to know that how we feel about how we look affects how we feel in general, which is logical. I completely agree with this post, I was the same way, in high school I almost always wore makeup, nervous to go without it. But here, I’ve noticed that as I’ve stopped wearing it to class, I have become more confident. One thing that almost concerns me with makeup is how you can completely change how you look from it. If someone is always contouring their face and using every product in the business than obviously they’re going to be disappointed once they take that mask off. They’re not used to seeing their natural face! I’m really glad you’ve posted this blog as it is extremely relevant these days. I strongly agree with what you wrote in this post. I ALWAYS used to wear makeup to school, especially my senior year of high school. Whenever I went without makeup, I always felt ugly. My freshman year of college, I stopped wearing makeup to class and only wore it when I went out, and I do the same this year. I have noticed that my confidence in myself has shot way up. I think that once you are used to seeing yourself without makeup constantly, you start to become more confident. This is great because when you do put makeup on you feel extra great! Going long periods of time wearing makeup and seeing yourself without it can truly lower your self esteem. I think that it is important for girls to go makeup free as much as possible. As a guy, I cannot personally relate to this because I do not wear makeup. However, your article made me curious about when women started wearing makeup and the reasoning then for it. The best article I found was this http://www.wisegeek.org/what-is-the-history-of-makeup-wearing.htm Not sure if it is the most credible source but it claims that both men and women started wearing makeup around 4000 BC for similar reasons as it is used today. Do you think that it is better for girls and women to be confident without makeup? Is it okay if wearing makeup makes someone more confident than they would be without it? Basically, is it good, bad, or neutral to rely on makeup to feel more confident? Your post attracts me a lot. Because I like makeups but I’m not crazy about it because it causes acne on my skin, and the more I use makeup, the more I need to cover my imperfection. Generally, I do agree that girls feel more confident when they have makeup. It’s not really because how much difference it looks, mostly it’s only that wearing make up let ourselves have more self-esteem. Moreover, the correlation in this topic can also be reverse I think. This article is interesting because I know I feel more confident when I wear makeup. However, over the past 2 years and I have started to wear less and less makeup and now I barely wear makeup. I wear it when I go out, but I have realized I do not look much different with makeup on then I do when I am not wearing makeup. Half the reason I dont wear makeup is because it take forever for it to come off and I am too lazy to wakeup a little bit early so I can apply it. I love makeup and shopping around in Sephora. I generally do not wear makeup to class but definitely do on the weekends, while I do think I look better with some eye shadow and bronzer, I thoroughly enjoy doing my makeup. I love seeing what is out there and new, and reading reviews etc. Some girls are in to make up more as a hobby than an appearance type thing.